A blog on latest smartphones, tech gadgets and related technologies. Last year Nokia made a comeback in the market with the launch of it's new android smartphones. From last year till now Nokia has launched many smartphones like Nokia 6, Nokia 8, Nokia 7 plus, Nokia 2, Nokia 3, Nokia 5 and Nokia 3110. So it launched smartphones in all the price segments. 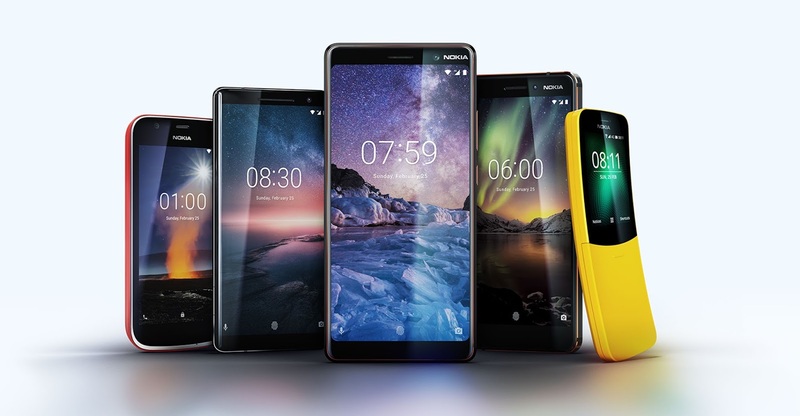 This year also at MWC 2018 Nokia launched 5 new smartphones. These five smartphones are Nokia 8110 4G, Nokia 1, Nokia 6 (2018), Nokia 7 plus and Nokia 8 Sirocco. So today in this we will discuss about all these phones. The era of cell phone start with feature phones. Feature phones is the initial stage of our smartphone of nowadays. But do we require those feature phones in today's era of smartphones? Actually it depends on personal preference. Nokia at MWC 2018 launched a new feature phone known as Nokia 8110 4G. It is a rebuilt version of Nokia 8119 which was launched back in 1996. This is a slider type phone in the shale of a banana. The interesting thing is that it runs on KaiOS which also powers the Jio phone launched last year. Nokia 8110 has a curved design just like a banana. For connectivity it is having 4G, Bluetooth, WiFi and GPS as well. It also has FM Radio. The phone is having a 2MP shooter at the back. The phone is having a 2.4" QVGA display, 4GB of internal storage and 1500 mah of battery. Also there is a feature of connecting and disconnecting calls by sliding the slider up or down. It also has a 3.5mm headphone jack. The phones comes in two colors that are Yellow and Black. 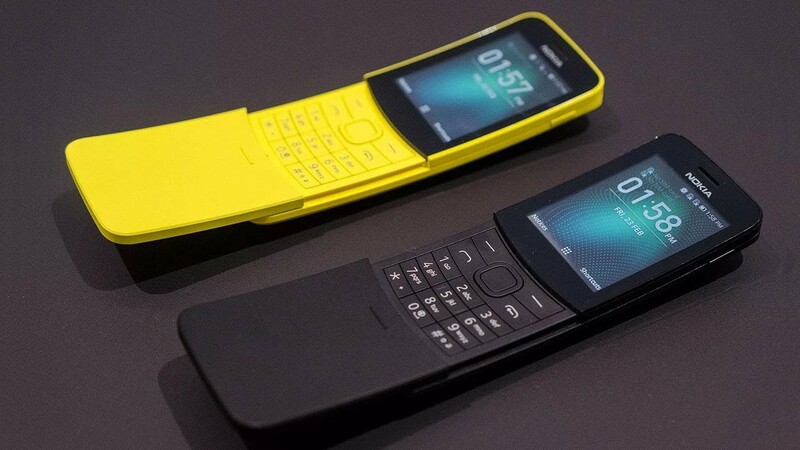 Nokia 8110 may be available from May and the price will start at €79. 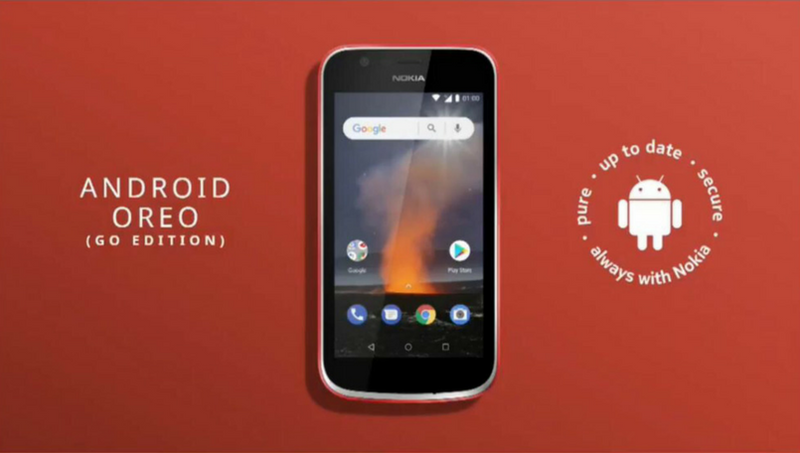 We already knew that Google would launch a smartphone with Android Oreo (Go edition) OS at MWC 2018 and that smartphone is this Nokia 1. Nokia 1 is the first smartphone to run on Android Oreo (Go edition). Android Oreo (Go edition) is the project by Google in which the phone having basic hardware will run on Android Oreo (Go edition) operating system. This OS is a lite version of Android Oreo which will run smoothly with the basic hardware in this phone. Nokia 1 is powered by Mediatek chip which is a quad core chip with each core cloaked at 1.1GHz each. The phone comes with 1GB of RAM. The phone has a screen size of 4.5" which has a resolution of 480*854 pixels. It has a 5MP primary camera and a 2MP secondary camera. The storage in the phone is 8GB and can be expanded upto 128GB via micro SD. It is having a 2150mah battery. Google has launched many apps under this project such as Gmail Go, YouTube Go, Files Go and many more. It has also featured the phone with Google Assistant Go for AI support. It also comes with Gboard Go. All these apps use less storage and less RAM. These are just the lite versions of their parent apps. So there will be some crosscutting of features while using the apps. 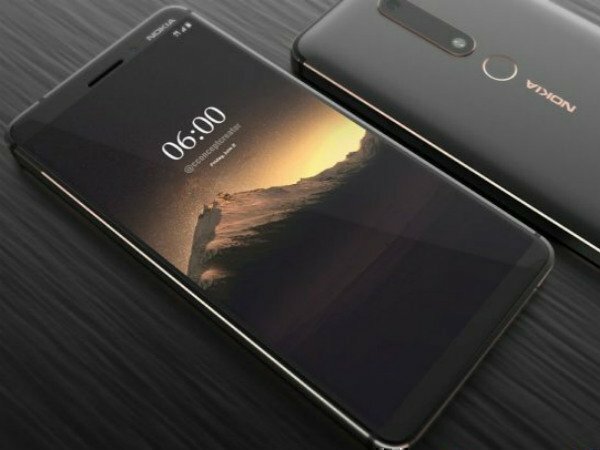 Nokia also announced Nokia 6 at the MWC event and this is the 2018 version of the Nokia 6. Nokia has already launched this device in China but now it is launching it globally. Nokia 6 has the same design as that of previous version. It is having the same glass and aluminum design. The screen is a 5.5" Full HD screen which has an aspect ratio of 16:9. The phone is powered by Qualcomm's snapdragon 630 chipset which is an octa core processor with each cortex A-53 core cloaked at 2.2GHz. The chipset is an upgrade from previous Nokia 6 which is powered by Qualcomm's snapdragon 430. It is having Adreno 508 GPU for better graphics. The phone comes out of the box with Android 8.0 Oreo. The Operating System in the phone is stock Android. The phone comes in two memory configurations 3/32GB and 4/64GB. The camera is same as the previous Nokia 6 that is a 16MP shooter with f/2.0 aperture and 1µm pixel size. But it has support of Carl Zeiss which will improve the photo quality. It is having a front shooter of 8MP with f/2.0 aperture size. Nokia 6 comes with Nokia OZO audio with 2 microphones. It is also having USB Type-C connector. The phone also supports fast charging with 50% of battery filled in 2 hours. The phone is having 3000mah battery. Nokia 6 is priced at around $300. Looking at the specs of the phone it is somewhat on the costlier side. But one thing is good with these Nokia devices that they receive updates really fast. Nokia 7 plus is yet another device from the company. It is in the premium mid range segment. 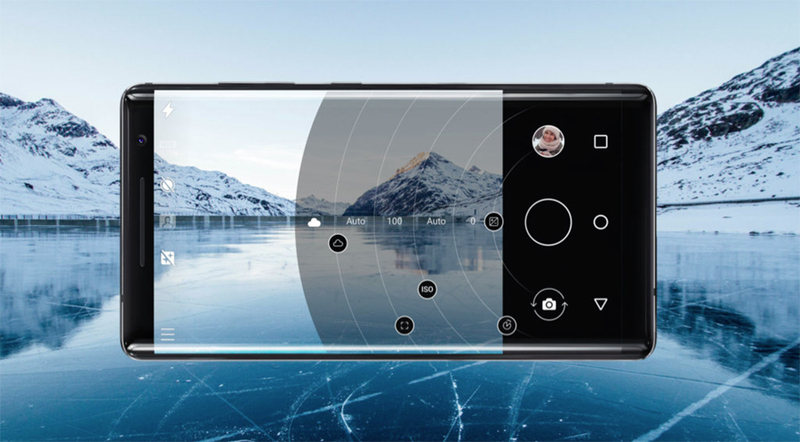 It is the first smartphone from the Nokia to have a 18:9 aspect ratio display. The phone is having a metal design with a single layer of aluminum and over it 6 layers of paint to give it a matte finish. The design of the phones is really good. It is having a 6.0" screen with FHD+ resolution. This display has an aspect ratio of 18:9. This is the first phone from Nokia with such display. 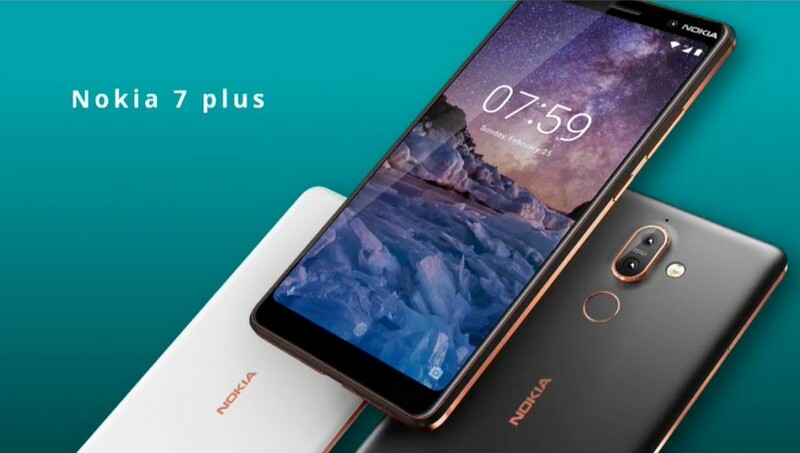 Nokia 7 plus is powered by Qualcomm's snapdragon 660 chipset which is an octa core processor with four kryo cores cloaked at 2.4GHz each and the other four kryo cores cloaked at 1.8GHz each. The phone is having a dual camera setup of 12MP f/1.75 aperture + 12MP f/2.6 aperture telephoto lens. The camera is powered by Carl Zeiss technology. On front it has a 16MP f/2.0 aperture lens. This camera is also powered by Carl Zeiss technology. It also supports bothie feature earlier which was only present on Nokia 8. The phone is having a 3800mah battery and a USB Type-C connector. It also supports fast charging just like Nokia 6. The phone comes out of the box with android Oreo and it also has stock android OS. But the price of the phone is really high, it is priced at €399. And it comes in two colors Black/copper and White/copper. Nokia also launched it's next flagship at the MWC known as Nokia 8 Sirocco. This is the successor of Nokia 8 which was launched last year. The phone looks like Samsung S series smartphones as it has curved edges like Samsung S series. The design of Nokia 8 Sirocco is really good. It is made up of stainless steel back which has more strength than aluminum. On front it has a 5.5" screen with 16:9 aspect ratio. The display is p-OLED type which is made by LG. The resolution of the display is 1440*2568 pixels. The edges of the screen are curved just like Samsung flagship phones which look really cool. For audio the phone is having 3 microphones. It is having a battery of 3260mah and it also supports fast charging. Nokia 8 Sirocco is powered by Qualcomm's snapdragon 835 chipset which company also used in Nokia 8. The phone comes with 6GB of RAM and 128GB of internal storage. 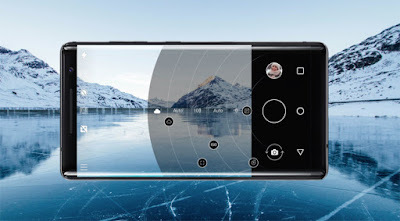 The camera is same as that of Nokia 7 plus that is dual 12MP camera sensors with one simple and other being a telephoto lens. The front camera is also same as that of Nokia 7 plus. The price of Nokia 8 sirocco is €750 which is quite high by seeing the specs of the phone. Is there really any change in new iPhone XS and XS Max? So how Good is Samsung Dex? Why do people want a 3.5mm jack in phones?